Civil Defence volunteers are set to use drones to assist gardaí - particularly in missing persons cases. A total of 43 volunteers have received drone licences after they completed a pilot training programme. There are now 60 trained drone pilots in 20 operational units throughout the country, the Minister with Responsibility for Defence, Paul Kehoe, revealed. 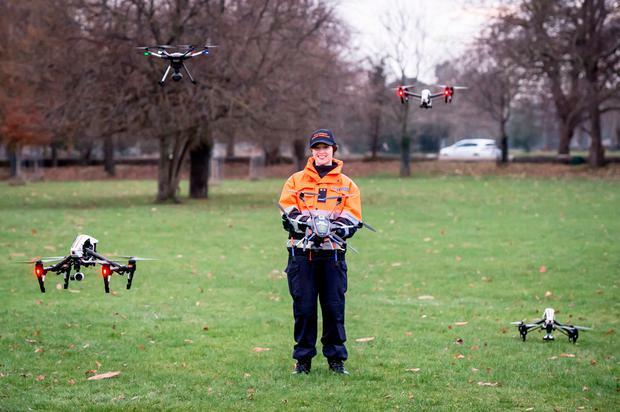 Mr Kehoe, who attended a Civil Defence awards ceremony at the Phoenix Park, said the 20 drones were located throughout the country and in each major emergency management region. "Civil Defence has never been afraid to change and has continued to thrive with the major transformations that have taken place down through the years," he said. "That success is very much to the credit of everybody assembled here today and in particular to the volunteers who give of their time and expertise. "In particular, drones have assisted Civil Defence volunteers when An Garda Siochána has requested support from Civil Defence, especially in the case of a missing person." Civil Defence are now on call 24 hours a day, seven days a week to deliver an aerial search capability to An Garda Siochána to assist them in their role to find missing persons. This service has been enhanced in the last 12 months with thermal imaging cameras which allow the volunteers to carry out effective searches at night for vulnerable missing persons. The service is also used to assist the county Fire and Rescue Services to carry out rapid assessment of wild land fires in inaccessible areas. A spokesperson for the Minister for Defence said that Civil Defence had invested considerably in the area of drones and training in recent years. With these new pilots, there are now 60 trained pilots in 20 operational units throughout the State. Each Major Emergency Management Region (MEM) has access to multiple craft and crews with specialist equipment held in reserve at a national level.